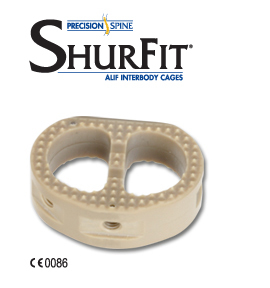 The ShurFit® ALIF Interbody Cage is designed for Anterior Lumbar Interbody Fusion. The ShurFit design offers a large contact area, optimizing vertebral body support while minimizing risk of subsidence. The large graft window allows for maximum biological coverage area, enhancing the opportunity for successful fusion. Simple instrumentation offers ease of implantation for surgeons, while the unique tooth pattern geometry minimizes the potential for expulsion. The PEEK-OPTIMA®* ShurFit Interbody Cage is available in multiple sizes to accommodate varying anatomies and permit optimal patient matching.